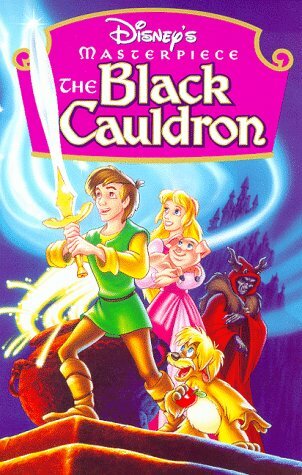 Before "The Hobbit" and "The Lord of the Rings," There was "The Black Cauldron"
"The Black Cauldron" (1985), directed by Ted Berman and Richard Rich based on a book by Lloyd Alexander that itself was from Welsh legends, was a precursor to the modern craze about "The Hobitt" and its line of fantasy films. As usual, Walt Disney Pictures was ahead of the field in seeing the possibilities in these types of animated features, but for once, the execution was lacking. 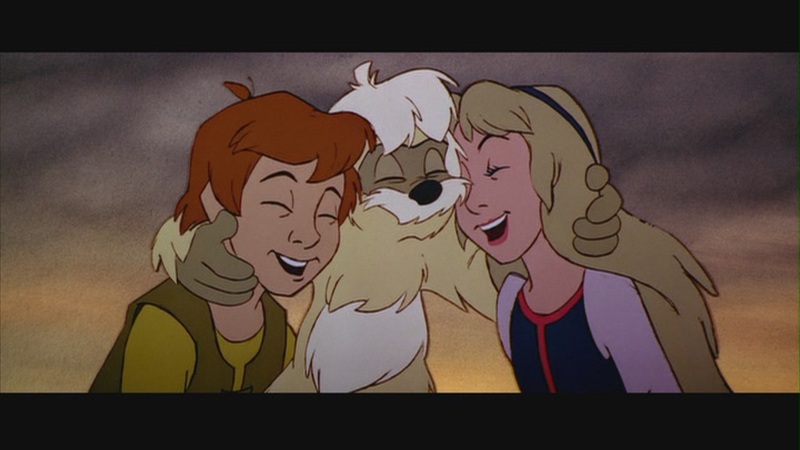 The story behind "The Black Cauldron" is more interesting than the film itself, though, as with almost all Disney movies, "The Black Cauldron" has found its audience over the years and is considered a cult favorite. While regards by many as the absolute pit of Disney movies' fortunes, it is watchable and enjoyable, especially for fans of the "Lord of the Rings" and related films. Taran is a young man who lives on a small farm during the middle ages. He works as an assistant pig-keeper and dreams of becoming a great warrior, but must tend to his pigs, particularly the oracular pig Hen Wen. 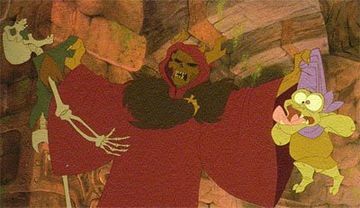 The Horned King (he wears antlers) wants Hen Wen because he thinks it will lead him to the Black Cauldron, which reanimates the dead. The local enchanter Dallben warns Taran to hide Hen Wen, but he futzes around and the pig is captured by the Horned King. Taran, chagrined, tracks the soldiers who took Hen Wen and meets Gurgi, who accompanies Taran on his quest to retrieve Hen Wen. Sneaking into the castle to get Hen Wen, Taran sets it free but is himself captured and thrown into a dungeon. 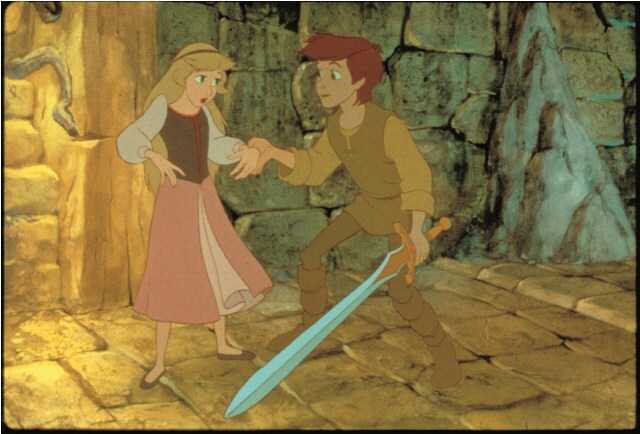 Princess Eilonwy, a girl his age, releases him because she, too, wants to escape. They explore the tunnels beneath the castle and find the burial chamber of an ancient king, complete with magical sword. Taran takes the sword and they manage to escape, along with fellow captive Fflewddur Fflam. Reunited with Gurgi, the four set off to find Hen Wen. They find the underground home of the Fair Folk, small fairies who it turns out have Hen Wen. King Eiddileg says that he will have his people take Hen Wen home and also mentions that he knows the location of the Black Cauldron. The four immediately set out to destroy it. Eiddileg's annoying minion Doli serves as their guide, and he takes them to the Marshes of Morva. Three witches - leader Orddu, greedy Orgoch, and Orwen (the nice one who develops a thing for Fflewddur) - control the Black Cauldron. They scare off Doli, but Taran stays and makes a deal with them: he will trade his sword for the Black Cauldron. Before they depart, the witches reveal that the Black Cauldron is eternal and its power immutable until someone climbs in and allows the Black Cauldron to kill him. The Horned King's soldiers then appear and seize the Black Cauldron along with everyone but Gurgi. 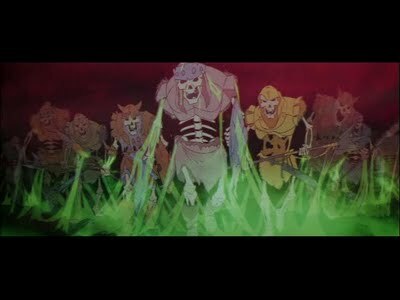 Back at the castle, the Horned King uses the Black Cauldron to raise an army of skeletal Undead with whom he intends to conquer the world. Gurgi rescues the captives, and Taran decides that he must throw himself into the Black Cauldron in order to stop the Horned King. Gurgi, though, beats him to it and sacrifices himself, and the power of the Black Cauldron is destroyed. His armies gone, the Horned King seeks vengeance against Taran, and a personal confrontation ensues between the two with the Black Cauldron simmering in the background. "By this sword shall I smite thy enemies." The story, while it sounds fairly complex, is actually very straightforward: there is a MacGuffin that everyone wants, and they spend the entire film figuring out how to either get it or prevent their enemies from having it. There was so much filler material thrown into the first "final cut," though, including truly shocking scenes of mutilations and deaths, that Jeffrey Katzenberg went ballistic. When producer Joe Hale (who came up with the story and no doubt felt a proprietary interest in the film), who had been an animator of Disney movies since the 1950s, refused to cut the film Katzenberg wished, the newly appointed Katzenberg started doing it himself by his own hand. Ultimately, entire scenes were removed, including some gory deaths that Katzenberg felt were too explicit for children. 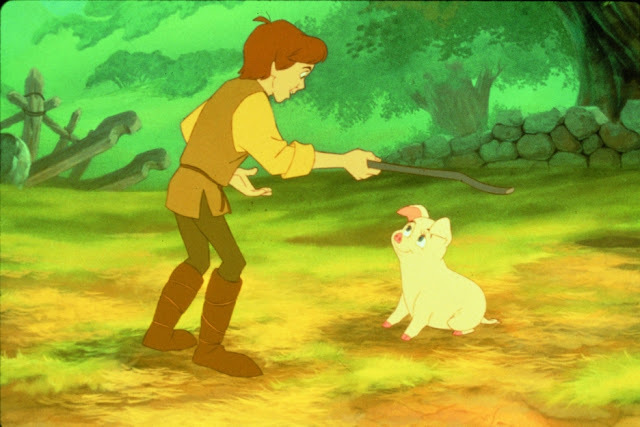 The release date of "The Black Cauldron had to be pushed out from the usual Disney movies November time period into the more competitive summer season, and Hale (who no doubt was correct in what he did to protect the film) wound up retiring. To this day, the soundtrack jumps at one spot because of this last-minute editing. This is what is known in the business as a "troubled production," and the film flopped at the box office. 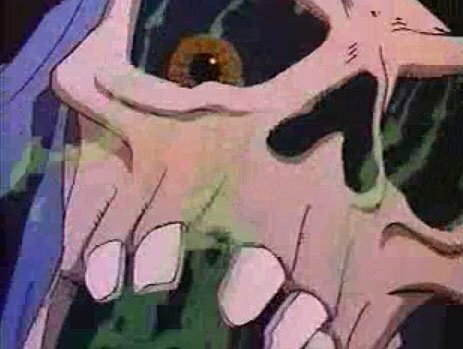 "The Black Cauldron" is very dark, and not just the story line. The action always seem to be set in caves or dungeons or dark buildings or stormy weather, with gloomy skies and only occasional patches of sunlight. The characters are voiced by little-known actors, only a few of whom have become better known over the years. The character of Taran, who logically should "come of age" or develop or metastasize or something in the course of the film, doesn't. He finishes "The Black Cauldron" the same as when he started, only minus the dreams that were the only thing that made him interesting in the first place. The most delightful sequences feature the fairies who resemble Tinker Bell, but any moments of lightheartedness are overpowered by the omnipresent deathly tones of Bernstein's dramatic score. 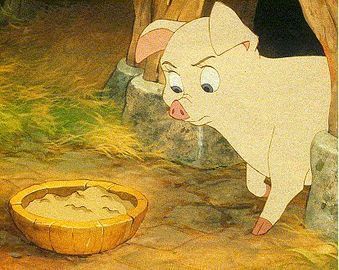 For what it is, "The Black Cauldron" is a Disney movie that works well as a dark, brooding meditation on ambition and comradeship, but it isn't surprising that after this, the studio returned to the safe light comedy of talking mice in "The Great Mouse Detective." Creeper, a minion, is abused unmercifully in "The Black Cauldron"
The voice actors behind "The Black Cauldron" were mostly low-profile types who have remained so. The two exceptions are William Hurt in the small but pivotal role of the Horned King, and narrator John Huston, who is famous for works done decades earlier. Otherwise, most viewers will not recognize the voices of Grant Bardsley as Taran, Susan Sheridan as Eilonwy, Freddie Jones as Dallben, Nigel Hawhrorne as Fflam, or Arthur Malet as King Eidilleg. John Byner, a true voice artists who did awesome impersonations of the celebrities of the day such as Richard Nixon, voices both Gurgi and Doli. He will be instantly recognizable by anyone who lived through the Seventies and recalls his brief, hammy appearances on just about every bad television series from that decade. That the voice actors were unknown doesn't hurt the film, but the fact that they have remained anonymous is telling. Bardsley joined the ranks of young Disney lead voice actors who were quickly forgotten, a club populated by the likes of Kelly Reno from "The Black Stallion" and Kathryn Beaumont in "Alice in Wonderland" and "Peter Pan." 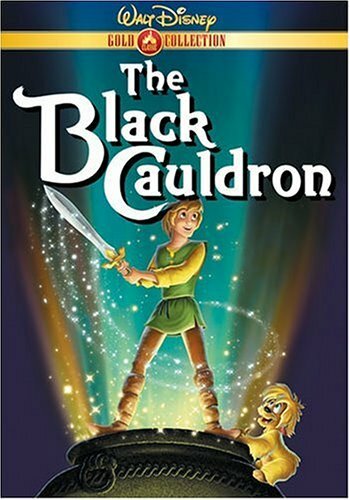 Somewhat surprisingly for an animated film that has no songs, "The Black Cauldron" soundtrack by Elmer Bernstein has gained in reputation in the years since "The Black Cauldron's" release. The film "The Black Cauldron" may be obscure, but the score of "The Black Cauldron" has had a life of its own and is a journey into a fantasy world full of ominous melodies and bleak passages.In 2012, it was re-released in its entirety (most of it was absent from "The Black Cauldron"'s final cut) and is one of the epic soundtracks of all Disney movies. 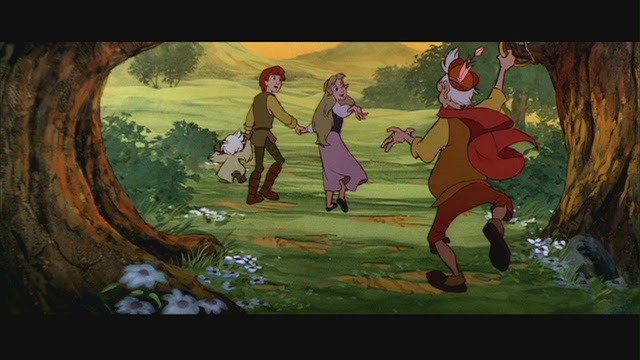 The sound system used for "The Black Cauldron" was Dolby surround sound, cutting edge technology at the time, and "The Black Cauldron" was the first Disney movie since "Sleeping Beauty" to be shot on 70mm widescreen film. The film's failure was not because of lack of effort, the stars just weren't aligned properly at that time for Disney movies. 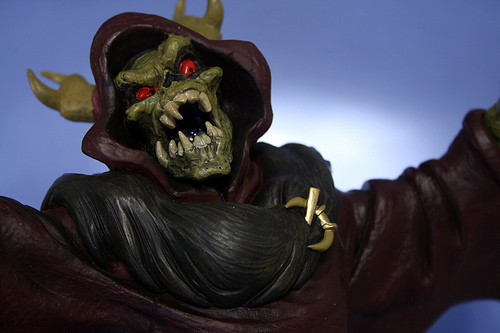 "The Black Cauldron" foreshadows many animated and live-action films of the 2000s. Besides the aforementioned "The Hobbit" and the "Lord of the Rings" trilogy, the idea of a lowly worker yearning to become a famed warrior protecting his people and then getting that chance because of the intervention of magic was picked up in "Kung Fu Panda" and "Kung Fu Panda 2." "Hey, wait for me, I have cookies!" There is a reasonably small but determined fan base for "The Black Cauldron." Those fans have been successful in getting Disney to release successive transfers for the home video market, most recently for "The Black Cauldron"'s 25th Anniversary on September 14, 2010. There is a lot of extra material from "The Black Cauldron" production (12 minutes was cut by Katzenberg alone) that no doubt remains buried in the Disney movies vaults. "The Black Cauldron" may wind up having a continuing life after its initial death just as if the Black Cauldron itself had reanimated it. Superb review. Thanks for including the Siskel & Ebert clip!